Butterfly Threads: Seeing and Sewing Stars! Our very first finisher is Dyann Cox from Arizona!! I am so impressed that she is finished and has it QUILTED and bound! Honestly, I'm still piecing my borders. I love her colors and fabrics and everything about her version, so she's getting a little happy mail from me this week! This stunning finish deserves a reward! And my sweet friend Angie from Quilting on the Crescent is almost finished as well. Her blue and white version makes me smile every time I see her pretty post updates! Angie is so creative and always finds a way to put a fresh twist on anything! I just love her style. 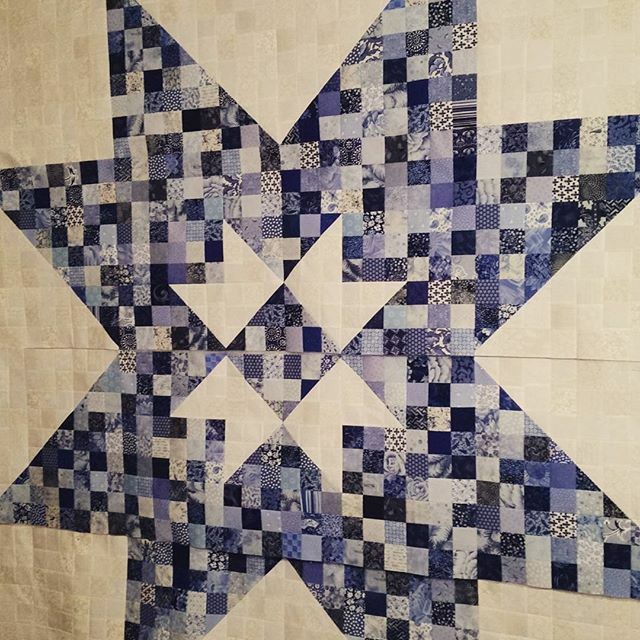 As for me, I'm still working on my borders and I obviously have a hard time following my own directions because the center of the star is pieced incorrectly. Good grief! I am considering leaving it as I kind of like it this way, or maybe I will swap those four center blocks around. Let me know if I should 'leave it' or 'swap it' in the comments. If you would like to make the star quilt you can find the printable version at the top of the blog labeled Scrappy Star Sew Along 2017 This free printable version will only be available through the end of the year. Please print your copy now if you want to save it for later. I like your "mistake" better than the original...I say leave it like it is!! Oh my goodness--what lovely quilts--I must admit I am strangely happy that you pieced your center wrong--lol--;)))(only kidding...sort of) so, I am not the ONLY one that does those things, huh? I would leave it...I like it, too. Oooh - completed stars!! I'm inspired! PS - I like your boo-boo. You should include the "alternate" instructions in your pattern! I actually love your center star- doesn't look wrong! My center is done, just needs a press. I'm undecided about the borders soooooo need to work on that this week. After seeing your "mistake" I think I will use that placement for my center. Alas, I am still in the nine patch stage. Just consider your center an alternate design choice. I wouldn't change it, but I'd document it in the directions so latecomers won't get confused (some of us are confused enough without any help). I really like your oops and I'm with KatieQ, I think I might try that placement whenever I get there. Like your boo boo best!! But either way is great. I love the colors you have selected for your quilt. They are just so charming. I like your center the best too. I like both versions of the star equally well. I would just include each as a variation of the pattern and I would call yours an "enhancement" at this time. I took a workshop from a "nationally known teacher." When I had one block completed, I proudly went to show my block. The teacher quipped, "You've invented a new block. You need to ..." She had no idea that it was all that I could do to get to the workshop and that I have processing issues due to illness and medication. The workshop went downhill from there. I love both and it's an individual preference as far as I'm concerned. I'd just have to toss a coin for my own quilt. I love it and say "leave it" Add it to your future pattern as an alternate setting! I found your blog on another blog I follow! She was doing your quilt-a-long! I think I will have to put this on the quilts to be made list! It is so pretty and looks fairly easy! Thanks for the pattern! They are all beautiful! I love Angie's blue one. And as for yours, I like it just the way it is. Different is good! I'm way behind, but I'd probably fix it. Great quilts!